At the end of the 19th century, a movement extolling the virtues of traditional craftsmanship began. It was a rejection of the mass produced commodities of the industrial revolution and a desire for clean, simple styles and beauty. Architects such as Frank Lloyd Wright and Greene and Greene adapted the concepts in their designs. Gustave Stickley created mission style furniture, bungalow homes, and also the Craftsman periodical.Select Door's Arts and Crafts doors and glass designs are faithful to the spirit of this movement. 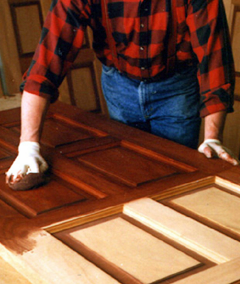 Select Door is a leading designer and manufacturer of premium grade hardwood doors in the Northeastern United States. For over 25 years we have provided the highest quality wooden doors available to the luxury home, condominium and commercial markets. Our business philosophy is captured in our slogan: "Artistry and attention to detail". We believe that each door should be a reflection of the homeowner’s unique taste and personality. We work directly with architects, builders and homeowners to translate their designs into reality. The result of these efforts are "Functional Works of Art", which accentuates the beauty and value of some of the most admired homes in America. Everyone in our company has a tremendous amount of pride in their work. We like to say that we combine old world craftsmanship with new world technology to achieve our customers' visions. Though each order is a custom project, our modern facility has the efficiency associated with a high volume manufacturer. Many of the advanced features and options we offer are simply not available from other door makers.